Not everyone shoots a good match every time. I can honestly say that the IDPA match the first weekend of December 2017 was the worst I've ever shot. Some people like to blame their equipment if the hits aren't where they need to be. We all know it is not the Rhino's fault my shots were not where I intended. The real problem is my lack of practice with this revolver. That is what led to my poor performance. Here is a break down of the stages and what I could have done better. Ah standards stages. Many shooters seem to despise them, but I always find them fun. For my squad, this stage was actually toward the end of the match and man was challenging. 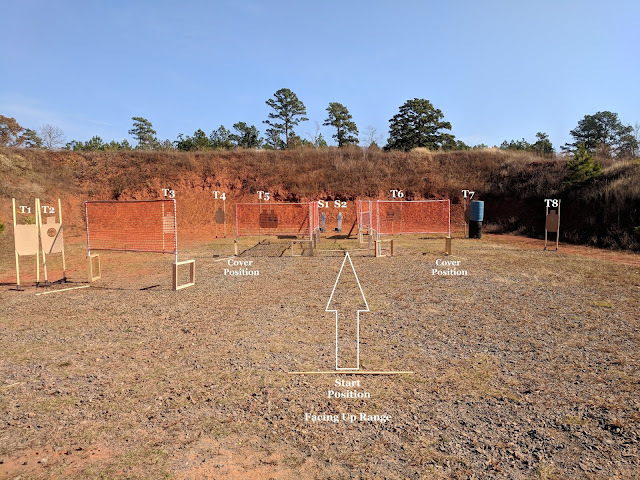 The Match Director gave us a bit of latitude on how we shot the stage as long as each position saw the use of a different shooting grip whether free style, strong hand, or weak hand. After watching other shooters have some success shooting free style, to strong hand, to weak hand between positions, the next man up decided to shoot it differently. The course of fire was limited, demanding four rounds on each body and two on each head. Not wanting to miss any of the headshots, he choose to shoot strong hand at the back, weak hand in the middle, and free style up close. His scores were significantly better than those before him. Nearly everyone remaining, including me, followed suit. Although one of the headshots was outside the perforation and resulted in a miss, the rest of the shots were almost all down zero. I'll take it considering the earlier stages. This stage required a table start with all shots taken from the seated position. The revolver was loaded to division capacity with three speed loaders positioned any way on the table. Since I load strong hand, I placed them to the left side of the table. I had to reach around them to pickup the Rhino at first, but it made for less awkward reloads. T1 required three to the body and three to the head. T2 - T7 were then engaged with two round each. I always enjoyed seated shooting because I don't usually shoot sitting down when I go to the range for a session. The first six shots were fast and all down zero. I even heard someone say, "The thing doesn't even recoil in his hand" during my first reload. That's a lie. It does recoil, but it recoils back instead of up. I put two each on T2-T4 without issue and reloaded again. I pulled the last shot on T7 into the hard cover and decided to make it up. I think that was a mistake because the reload and trigger press may have taken just as long as the five second penalty due to a stuck case. This MD likes to run stages twice whenever possible to give the shooters more trigger time. Stage three required the gun to be holstered, loaded to six rounds only with all subsequent reloads performed from the belt. At the buzzer the shooter stands, draws, then engages T1 with six rounds. 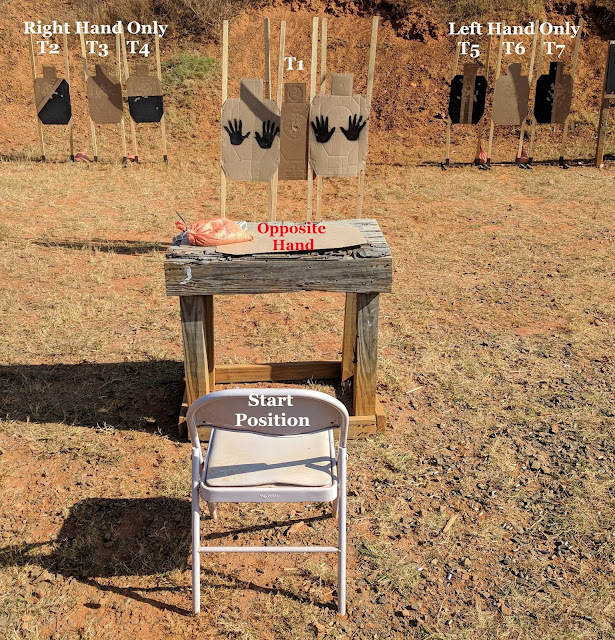 After a mandatory reload, the shooter must engage T2-T4 with the right hand only while the palm of the left hand was placed on the table for all shots. T5-T7 must be engaged with the left hand only while the palm of the right hand was placed on the table. This one was the most demanding stage of this match. 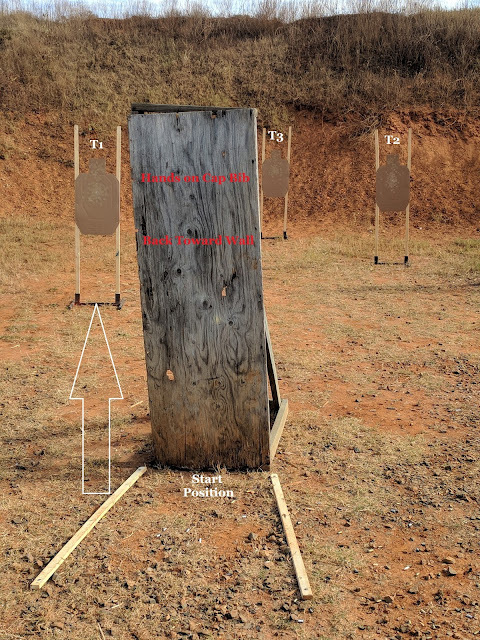 As the Rhino cylinder only holds six rounds, I would be reloading after each target array. Everyone else had a reload midway through the third target array. Sometimes it pays to play with a wheelgun, especially when the MD is often my only competition in the Revolver Division. He creates were revolver friendly matches. Engaging T1 resulted in more statements from onlookers regarding the Rhino's minimal muzzle flip. The left hand array went swimmingly with only two points down. Conversely, the right hand array saw a miss and several points down. The 10 pound trigger is significantly heavier than the 7 pound trigger of most of my S&W revolvers. I need to work on weak hand only. Our squad started on the bay with stages four and five. This stage required holster handgun loaded to division capacity with hands placed on the wall. Shooters must engage target T1-T3 with three to the body and three to the head. It was unlimited so makeups were permitted. Looking back now, I should have taken a few make ups. The title of this post is a direct reference to this stage. I blew my match by missing four headshots total and shooting a pair of D zone hits on T3. What happened? I said earlier that I am not going to blame the Rhino because this bad shooting is indicative of my lack of practice with this revolver. In my defense, there is a reason why my shots were high. I've been shooting my Smith & Wesson revolvers religiously for the past few months. The grip angle of the Smith's is different than the grip angle of the Rhino. I did not cant my wrist far enough to fully place the front sight post into the trench. This just shows that I need a lot more practice with the Rhino. I will definitely put in the dryfire at home, but recently received a new S&W N-frame from my fiance. As you can imagine, the majority of my range time will be dedicated to this new revolver purchased for USPSA. After that terrible first stage, I started trying to figure out what I was doing wrong. I walked to the safe area and performed a few draws. When I presented the revolver, I noticed the front sight was high every time until i readjusted my grip. Stage five was a straight forward engage while advancing in priority. The handgun was downloaded to six rounds. The stage began facing up range with hands on the brim of the hat. At the buzzer, I turned and engaged T1 on the move. No problems there. I stopped and reloaded to ensure I didn't run out of room before I got to T2. Although I'm pretty sure I put all six rounds into the down zero, the safety officer said there were only five holes on the paper. Welp. I reloaded a final time before engaging T3 on the move. A couple points down, but it was the miss on T2 that ruined that stage. This final bay contained stages six and seven. This was a bit more of a run and gun stage and everyone was excited to shoot it. All paper targets of stage six required one shot to the body and one headshot. For a bit of a challenge, shooters had to engage T1-T2 while retreating. T3-T5 must be engaged from cover. The two steel poppers had to fall to score with a final array of targets to shoot while slicing the pie. Shooting while advancing is challenging. Shooting while retreating is a bit more difficult. The weekend before, I was actually on the range working on retreating fire, so T1 and T2 were both down zero. I was careful not to break the 180 as I moved to the first cover position. I shot wide to avoid the non threat on T5 and was down two. At this point I had two round in the Rhino. I actually missed both poppers on the move and had to do a standing reload before moving to the final array of T6-T8 to engage from cover. Poor trigger control. The make up shots on the steel really hurt my time and threw off my reload plan. I had a final standing reload at the last cover position. Not great. This was the final stage of the match. The gun started loaded to division capacity, shooter facing up range with hands clasped on top of the head. T1-T2 as well as the steel poppers needed to be engaged while advancing. The start position was incredibly close to T1-T2 and these could quickly fall behind the 180 degree line. I engaged this array first before the steel. I guess I hadn't learned my lesson about trigger control because I missed both shots on S1 and S2 while advancing. As both steel had been engaged, I decided to move to the array on the right and come back to them later. I engaged T6-T8 quickly before reengaging the steel. This time both poppers fell and I engaged T3 on the move as soon as it became visible. A final reload at the cover position and the stage was over. So many make ups! At least I had fun running across the stage. So there you have it. 21st out of 21 shooters. Abysmal. I may not be a great shooter but I usually end up around a little less than midway from the bottom. Although I realized my mistake relatively early, my shooting really didn't improve that much. The newest blaster and the neatest gear don't guarantee success in a match. Success comes down to practice with your chosen firearm. Despite my performance at this match, I still really like the Rhino and fully believe in the unique design. Several of my squad mates shot this strange little revolver after the match. Everyone who tried it was impressed by the lack of muzzle rise. 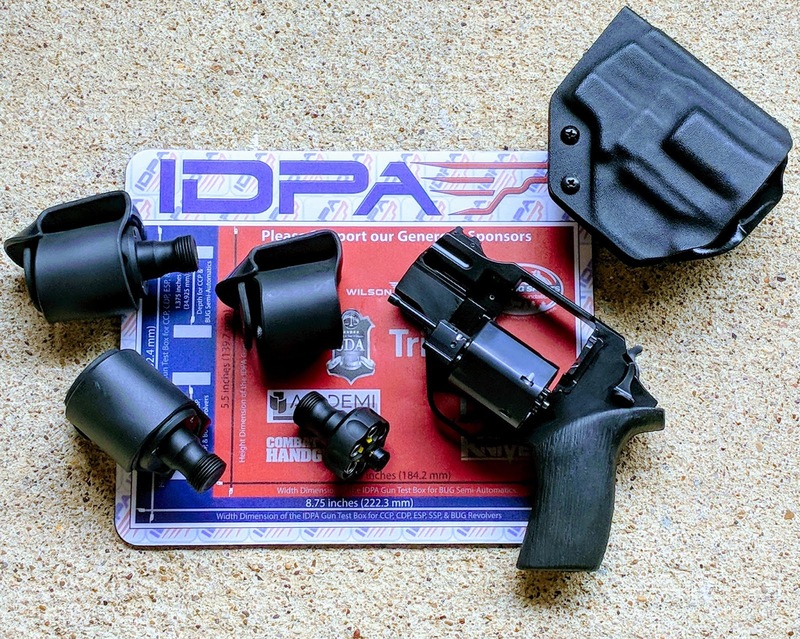 I think a 4" Rhino in .40 caliber would be a monster in IDPA's revolver division. The reduced muzzle rise, coupled with the speed of moon clips, would seemingly make a great competitor. Maybe I'll get one and try it out!